Pastry Chef, Janan Juliff, THE CAKE DIVA, was raised on an Iowa farm surrounded by fresh fruit, produce, eggs, butter and milk. 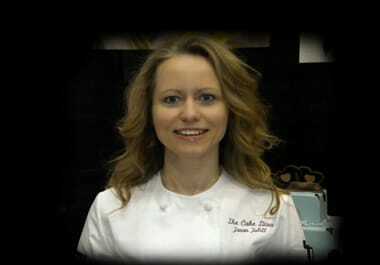 She was introduced to baking as a very young child working beside her mother, a professional cake decorator. After working as a professional church musician for 20 years, Janan pursued her baking and pastry certificate from The Art Institutes International Minnesota in downtown Minneapolis, MN and graduated with honors in 2005. Chef Juliff was an instructor at the downtown college, and continues to compete in area shows while sharing her gifts as THE CAKE DIVA. Best Dessert for a ‘Year of the Dragon’ themed cake at the Taste of Chocolate 2012, Bloomington, MN. Gold medal for a Shakespearean Music-Themed Chocolate Cake creation in the 2007 Chocolate Extravaganza, Minneapolis, MN. 2nd prize in the 3-tiered Cakes Division at the 2005 Oklahoma Sugar Art Show, a prestigious national competition. are uniquely created using ORGANIC ingredients in her scratch-made cakes and desserts with NO added preservatives, ZERO trans fats, NO corn syrup, NO shortening/lard, NO Food coloring unless requested. YES = ORGANIC FRUIT and fruit purees are the only products THE DIVA will use for their incredible flavor, purity of product while supporting local farmers. The Cake Diva LOVES community…. and makes numerous donations each year. ICING SMILES is The Cake Diva’s primary organization to which she donates cakes to kids celebrating milestones while living with cancer. Other organizations are considered for small cake donations. and concerned about the carbon footprint of her business. THE DIVA buys local ingredients including Rochedale Creamery Butter and Schultz Organic Eggs, and as many other ingredients as possible from local producers. THE DIVA uses recyclable boxes for packaging all desserts and pastries. originate in Europe, and are chosen to uniquely enhance the flavor of each dessert. is available for each dessert including calorie count, fat, protein, carbohydrates, fiber, cholesterol, and sodium. DAIRY-FREE, GLUTEN-FREE, VEGAN desserts are available along with their nutritional information, if needed. to customers in Minneapolis and Saint Paul for $20. The rate outside the cities of Minneapolis and St. Paul will be charged an additional $0.585 cents per round trip mile. Larger orders requiring setup, such as wedding cakes and cupcake towers, have a $35 + delivery-setup charge. MINIMUM ORDER for custom cakes and desserts is $375 of product. You can also find Chef Juliff at www.chefsnaturally.com, a personal chef service. THE CAKE DIVA LLC is licensed and insured for your protection. All desserts are custom, and therefore, non-refundable.